and ready for your viewing pleasure. I stood in front of the rostrum in the National Cemetery with my parents. They hadn't seen the movie yet. My best-friend was next to them. He hadn't seen it yet. Another compatriot joined us who had seen it, but we were definitely outnumbered in our little knot of folks within the massive crowd. As Spielberg continued speaking, I leaned in to the group. "You really need to see the movie," I said, knowing that no matter whose ears it hit the odds were it'd hit a meaningful target. Spielberg was speaking about the history writ with lightning I had seen the night before. It still amazes me that it has taken us a century's worth of time and this brilliant director (as opposed to his countless forebears) to steal that phrase back from the racists. And he was noting the gaps in history. "But even with history that’s as scrutinized as that of the American Civil War," the director noted, "some aspects, certain details, are gone forever." Spielberg is exactly right. History, by its very definition, is a fragmentary tapestry missing quilt squares left and right. "History forces us to acknowledge the limits of memory," Spielberg continued, "It tells us that memory is imperfect, that no matter how much of the past we’ve recovered, much of what once was or has been, now is lost to us." Then he started down the road that got my dander up. "I believe it’s the betrayal of the job of a historian to promise perfect and complete recall of the past and to promise memory that abolishes loss." So far, so good. But then the turn. with the aid of a treetop perch. "One of the jobs of art is to go to the impossible places that other disciplines such as history must avoid. To art, we enlist the imagination to bring what’s lost back to us, to bring the dead back to life. This resurrection is, of course, just an illusion, it’s a fantasy, a dream, but dreams matter somehow to us." My heart reeled at the blow. Mr. E.T., Mr. Jurassic Park, Mr. Hook was telling me I couldn't do what I intend to do every day. What I already do whenever I step out in front of an audience of visitors. "History must avoid," Spielberg said, using imagination. "History must avoid," Spielberg said, trying to recover the lost and fill in the gaps. "History must avoid," Spielberg said, endeavouring to resurrect the dead. Interpretation is all about doing these things. We offer up the broken pieces of a fractured and piecemeal past and let visitors begin filling in the gaps, sousing out their own hidden meanings and meeting the dead once again. When you ask a visitor what they might have done faced by the stress and fear of the moment, when you ask them to place themselves in the minds, hearts and shoes of a soldier staring into the gaping maw of the enemy or a mother leafing through a newspaper and finding the name of her son in the list of dead, you're filling in the gaps of history we can't fill with evidence alone. Evidence only takes us so far in understanding the past. If we stop at evidence, and ignore the human heart, we'll never draw anything meaningful from history beside rote cause-and-effect relationships. These are lessons, yes, but shallow ones that don't resonate with the human soul, but which only resonate with the human mind's fixation on policy decisions. Spielberg's movie does just that perfectly. He's right. Art is an amazing medium through which to discover those moments. Tears poured down my face during those first 15 minutes of the film as the central meaning of the Gettysburg Address flickered on the screen and emerged from the mouth of a black man fighting for freedom. I cried as a pair of white soldiers lost their words when they spoke to the President, starstruck and babbling. I stepped into both their sets of shoes and felt their past. It wasn't a contrived past; it was real. Those feelings had real historical implications. The butterflies-in-the-stomach feeling found while meeting Lincoln or discovered when imagining real freedom wasn't fake. It was a simple interpretive time machine, asking the audience to try to live in that past for a moment. And I cried. For the bulk of the film I was sniffling, snorting or bawling. When Stevens presents his gift? Tears. When the roll call vote drags on and everyone expectantly hangs on the news? Saline drops all over my face. When Elizabeth Keckley casually tells Tad she was beaten with a coal shovel when she was younger than him, as if it's normal and not a travesty? It destroyed me. But art isn't the only medium through which we fill in the gaps in the past. All those things were real, Steven. They were real history. Not factual memories, but emotional ones of a past long lost and forgotten. History can be (and when undertaken to its fullest potential is always) a form of art. Don't take that away from those of us doing our jobs right. When you strip history of art and imagination, you get exactly what everyone hated in High School: names and dates to memorize and recite. You're wrong, Steven. Your movie is history, not just art. Those gaps you fill are filled with real history. It might not be what actually happened in those moments exactly, but the only past that matters is the usable past that each of us carries with us anyways. We all simply fill in the gaps we have to. Next time you're in the area, I'd be happy to prove it to you out on any of these local battlefields we have, gratis. History is exactly what you did, and we historians (some of us at least) do it daily. Let me show you. Between now and then I'll probably just watch your movie a half-dozen more times. Jacob dragged me somewhere again. I really should learn to say, "no," because no matter where I get dragged by Jake, it always ends up wrecking my brain for months and making me obsess about some amazingly minute interpretive experience. But I'm a glutton for interpretive punishment. Last year during the National Association for Interpretation annual workshop it was an historic diner. This year, with the conference being held in Hampton, Virginia, there are far more Civil War related speed bumps to roll over. Yesterday it was the Emancipation Oak. "It'll be amazing," Jake assured me, "It's a living thing that's a National Historic Landmark." I made a snide remark about, "living history," and joined him in the car along with Clayton and Travis, two more whip-crack interpreters. The tree is on the campus of Hampton University and is massive. It's an impressive Southern Live Oak, an evergreen tree that seems to envelop the sky with it's sheer mass. Under the tree 150 years ago, former slaves sat in rapt attention as the words of the Emancipation Proclamation were read aloud to them for the first time. Lincoln exclaimed in neat strokes of ink upon a page, translated into living words for the contraband gathered at the foot of the tree, that the slaves of the Southern states in rebellion, "henceforward shall be free; and that the Executive government of the United States, including the military and naval authorities thereof, will recognize and maintain the freedom of said persons." These poor shards of humanity, shivering in the shade of a even-then sprawling tree, saw new light as Lincoln took a massive step toward their freedom and equality. The fort that loomed on the horizon, the bastion of freedom named after James Monroe, now stood explicitly as a bastion to protect their freedom from the slave power. OK, so Jake was right. It was worth the stop. But then we went on another wild goose chase. "Now we're going to see the Hampton National Cemetery!" Jake declared. Into the car we piled again. After discovering there are two Hampton National Cemeteries, and that we had arrived at the wrong one, we hightailed it over to the correct one, again within the campus of the historically-black Hampton University. Four white boys in an SUV were waived past an incredulous security guard. She was sure we weren't going to cause trouble, but it was an odd sight at sundown. We wanted to find someone, and had our sights set on a few USCT soldiers. Travis produced his phone and listed off the names of some Medal of Honor winners resting within the cemetery's brick walls. We hunted down the grave of Color-Sergent Alfred B. Hilton. Hilton served in Company H of the 4th United States Colored Troops. He enlisted in August of 1863 at Baltimore. He listed his residence as Harford County, Maryland. He was married and in his twenties. He was 5 foot, 10 and a half inches tall. His complexion was black. Standing over the sod beneath which lay Color-Sergeant Hilton, we read a quick biography of his heroic act. Our glowing screens told the tale in the growing darkness. In late September of 1864, as the 4th USCT charged the rebel works during the Battle of Chaffin's Farm outside Richmond, the Color-Sergeant carrying the Regiment's flag was struck down by a bullet. Standing next to him was Sergeant Hilton, the United States flag tight in his grip. 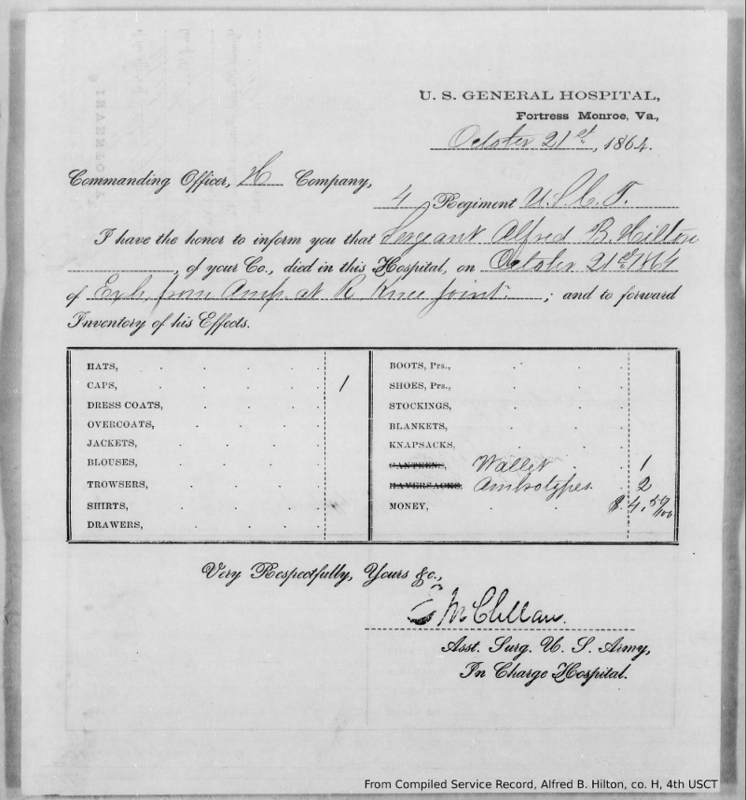 As his comrade fell, Hilton grabbed for the flag and, according to the Official Records, "struggled forward with both colors, until disabled by a severe wound at the enemy's inner line of abatis." Hilton urged his fellow soldier onward, passing the flags on to another man, "his thoughts were for the colors and not for himself." Hilton, bleeding from a severe wound in his right leg, was brought to the United States Hospital at Fortress Monroe. His leg was amputated at the knee. He lingered, sickness taking hold. Hilton died on October 21st, 1864. A package was returned to his company commander in the field from the hospital. Inside were simple things: a cap that had sheltered his head from rain or sun as he marched forward for freedom, a wallet with $4.50 worth of paper money, and two ambrotypes. Who were the faces in those pictures? Were they his wife? Was one a photo of him, waiting for a spare moment to send it home to loving hands waiting for a warm embrace that would never come? I looked up from the gravestone, a tear staining my right cheek. I swear it was from the cold. A tree caught my eye. Its leaves looked familiar. Behind Hilton's grave, shading his final resting place, is a Southern Live Oak. The branches don't spread as wide as the Emancipation Oak, but they're still strong. Color-Sergeant Hilton rests now, forever a free man under the shade of a cousin of the tree of first freedom, a stone's throw away from Freedom's Fortress. He is the Civil War in microcosm more than any other man. I'm glad I got the chance to meet him. I did it again. I went to Pennsylvania Historical Association's annual conference (this year in Harrisburg). I always seem to be the black sheep at these gathering, focused on raw emotional meanings and the usable past far more than the broader historiographical implications of either the proverbial or actual price of tea in China. This year I went to present a paper on the knock-down, dragout brawl that Daniel Sickles and William H. Tipton have throughout 1893 over the preservation of the Gettysburg Battlefield to a room full of professional historians. OK, so the room wasn't full. There were five spectators. Yeah. That's how these academic conferences tend to go for me. Before my session (where Dr. Bloom, my Master's thesis adviser joined me to talk about the Carlisle Indian Industrial School), I sat in on a session on Pennsylvania's colleges' and universities' Public History programs. It was interesting to see the lay of the land, but I was unimpressed by the general trend of the conversation. I think one of the key problems that academics (even public historian of the academic stripe) have is that they are terrible communicators for a general audience. I never got the chance to ask the question during the Q&A, "do you have a mandatory interpretation or communication course in your program?" Like a petulant preteen, I took to Twitter to grouse about it. "Here's the point the panel missed," I tweeted, "'office' historians can't communicate effectively w/ normal folks. That *NEEDS* to be problem #1." Twitter is one of the safer places to complain like this at professional conferences I've found because barely anyone over 30 pays attention to the social media dimension of these events. To some extent, I'm simply complaining aloud to myself like a psychotic mumbler in the corner of the Metro car, swathed in a worn fatigue jacket and sporting a unkempt greying beard. Much to my chagrin (and maybe elation) one of the panel's participants, Aaron Cowan from Slippery Rock University, wrote back. He noted that there's been, "much agonizing over this in profession." But his keen question was simple: "but do we ask this of English lit, chemistry, psych? Are historians worse?" So I bit. I responded. Twice. "I don't think historians are worse than all acads," I wrote, "but I fear the effect is more dire: under-informed electorate." "But," I noted, "I'm one of those funky, altruistic Federal public historians." I am one of those funky, altruistic Federal historians who thinks that our parks and sites of cultural import are sacred spaces and safeguards of liberty. If applied physics fails, and an engineer makes a miscalculation or two, a bridge falls down and a few folks end up dead. It's a tragedy but it's ephemeral. If applied mathematics fails, and an economist makes a poor prediction or two, some investors lose a chunk of change in the market. It's a loss but it's relatively small. But what happens if applied history fails, if public historians aren't effective in their work of communicating America to Americans? America is a society built upon a secular religion. Our sacred spaces are our historic places. And our citizens learn the craft of citizenship, the process, the pitfalls and the promise of America, within those temples to freedom. Public historians are the scions of those spaces. If we fail to help the public find the meanings they need, if we fail to even entice them to come inside the temples, we risk losing America. If applied history fails, and civics evaporates from the American peoples' consciousness, America falls down.